G. Steve Jordan uniquely interprets the landscape of the Mohonk Preserve and Shawangunk Ridge, and has done so for more than a decade. Presented in book form, Strength Beauty Spirit (now out-of-print) was a collection of his evocative, often lyrical images. 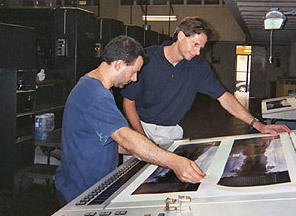 Some two years in the making, Steve traveled to Italy to oversee the printing of his book at one of the finest printers in Italy. 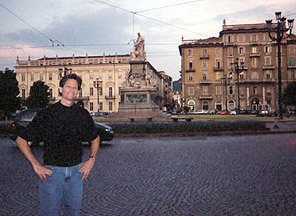 I traveled to Turin, Italy to oversee the printing of my book STRENGTH BEAUTY SPIRIT. Arriving in the beautiful city on a summer afternoon, I spent the rest of the day strolling through the many charming piazzas that grace the city center. 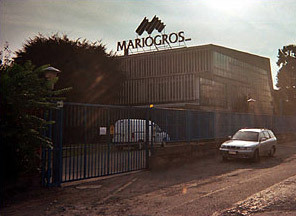 The printing was done at one of the finest printers in Italy, Mariogros. A colleague of mine working at Aperture had mentioned that Mariogros had printed many of the photography books published by Aperture over the years and so I was confident that the result would meet my high expectations. 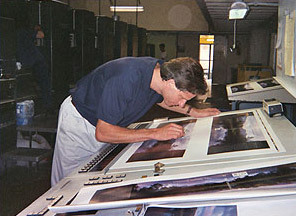 Each press sheet takes a while to set up properly, called the "make ready" and, after the first of the sheets is run through the printing press (seen behind us), I had to be "on press" to check on the result and make any changes. The pressman can subtly alter different areas of the sheet to yield a result closest to my own print sample. The presses run from 7 am to 10 pm with a new sheet being run every two hours, so I was required to be at the plant most of the time and, in fact, stayed in a small room they have set up for their out-of-town customers. Though the accommodations were spartan, the staff at Mariogros were very gracious and friendly and the espresso was superb. 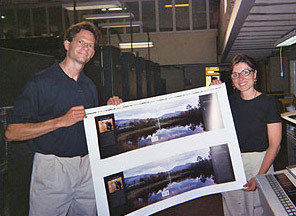 Once I looked over each press proof, I was required to initial the final sheet indicating my approval. After this step, they start the press once again and it takes just 30 minutes to print thousands of sheets, so I was extremely careful to be sure that the sheets were perfect. These initialed press proofs are kept on file to allow the book to be re-printed exactly as I originally specified. I was fortunate to work with Gabriella Bocchio, a very talented designer, press liaison and translator. She helped me communicate with the pressmen, who only spoke Italian, as well as assisting me on press to get the optimal results. Here we are holding up a sheet that is the cover of the book....perfect!